Bust 23", Waist 21", Hips 24"
1975, 70s Children, Retro School Clothing Patterns - Dress has zipper in back opening; long sleeves A, B with elastic in wrist casings, or short sleeves C, D with elastic in lower casings have gathered cap. 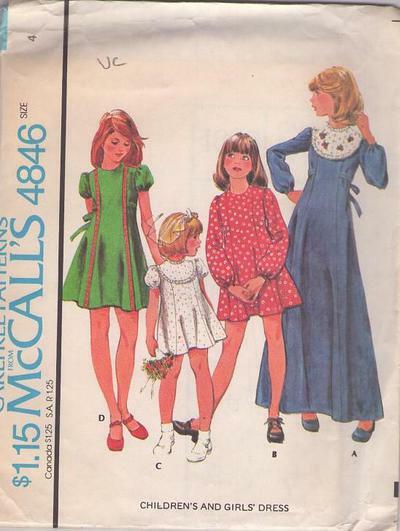 A, with contrast front yoke to be lined when cut of eyelet,ruffling and purchased appliques decorative or D with trim has tie belt included in front seams. C has front yoke and ruffling.